* For 128GB-1TB: Up to 160MB/s read speeds, engineered with proprietary technology to reach speeds beyond UHS-I 104MB/s, requires compatible devices capable of reaching such speeds. Up to 90MB/s write speeds. For 64GB: Up to 160MB/s read speeds, engineered with proprietary technology to reach speeds beyond UHS-I 104MB/s, requires compatible devices capable of reaching such speeds. Up to 60MB/s write speeds. For 32GB: Up to 100MB/s read speeds; up to 60MB/s write speeds. Based on internal testing; performance may be lower depending upon host device interface, usage conditions and other factors. 1MB=1,000,000 bytes. 7 For 64GB-1TB: A2 performance is 4000 read IOPS, 2000 write IOPS. For 32GB: A1 performance is 1500 read IOPS, 500 write IOPS. Results may vary based on host device, app type and other factors. 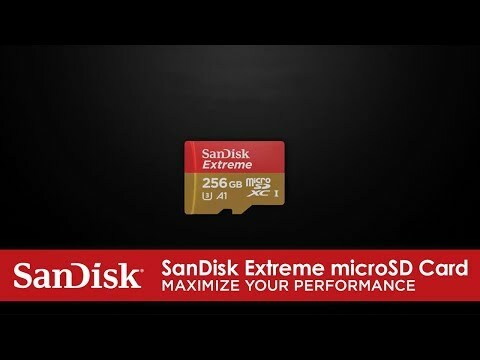 8 Comparison based on internal testing of SanDisk Extreme® microSDXC™ UHS-l card, versus current UHS-l cards with 100MB/s stated performance. Results may vary based on host device, file attributions and other factors. *Capacity 512 GB 1 TB Field cannot be empty. Please agree to the below terms and conditions.